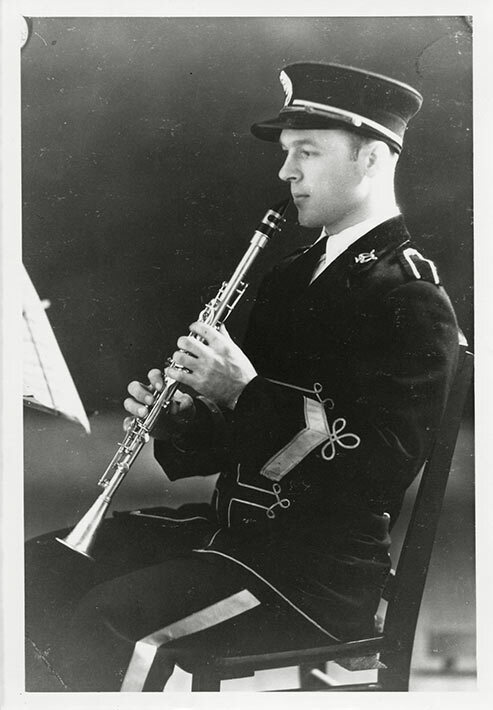 Black and white photograph of Fioravante (Fred) Tenisci playing the silver clarinet as a member of the Trail Maple Leaf Band in Trail, BC during the late 1930s. Tenisci arrived in Canada in 1928. From Halifax, he took a cross-country train and settled in Fernie, BC, where his father was already established. He worked in the coalmines for two years, at which point Tenisci’s father decided to return to Italy. A few months after his father’s departure, Tenisci moved to Trail, BC. He joined the Trail Maple Leaf Band and became an accomplished musician. He played the clarinet and the accordion, and could also sing. Tenisci was arrested and interned on June 10, 1940 as a threat to the Canadian state.